SDC summer building hours will begin May 4 and continue through August 24. The SDC will be closed on May 26 (Memorial Day) and July 4. New this year – the building will open earlier on Sundays (11:00 a.m.) and will continue to open at 8:00 a.m. on Saturdays. To see the full schedule, visit www.michigantechrecreation.com/operations/building_hours/Summer2014.pdf. Summer programming is here! With so many great summer options, what classes are you taking this summer? COMMIT TO BE FIT with Michigan Tech Recreation. Want variety? We got you covered. Health & Wellness. Fun & Fitness. High Intensity Workouts. Workshops & Specialty Classes. Check us out in the Studio, Pool, Ice Arena and outdoor fields with programs for youth, adults and everyone in between. Did you know? Michigan Tech employees who are TechFit benefit eligible can use some of their $150 (and $100 total for dependents) for summer programming! Classes are scheduled May – August. Join the fitness classes anytime by committing with an 8-punch class card OR try us out for a single session for only $6. Full session registration is also available for some programs. For awesome deals, event announcements and more, connect with Michigan Tech Recreation on Facebook. Join us anytime and COMMIT TO BE FIT at michigantechrecreation.com. 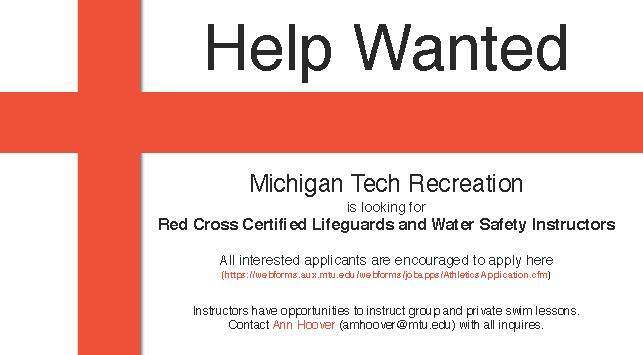 Michigan Tech Recreation is looking for additional Red Cross-Certified Lifeguards and Water Safety Instructors. Qualifications include Red Cross Certification in lifeguarding, first aid and CPR. Duties include monitoring and ensuring the safety of all patrons in the SDC swimming area and enforcing all site rules and regulations. Instructors have opportunities to teach group and private swim lessons. Contact Ann Hoover, amhoover@mtu.edu, with all inquiries. 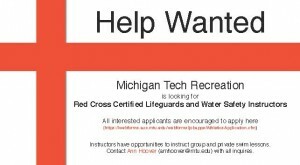 The application can be found at www.michigantechrecreation.com. The glove (and hats and coats) are coming off… or they will be soon! Are you ready for your summer wardrobe? Get your body ready for the big melt with Ballet Barre workouts! COMMIT TO BE FIT with Michigan Tech Recreation. Designed to shape & transform the body, each Ballet Barre workout combines elements of ballet, Pilates, and yoga to create a total body experience. Expect to shake, stretch, and sweat with Ballet Barre. Did you know? Michigan Tech employees who are TechFit benefit eligible can use some of their $150 (and $100 total for dependents) for this awesome class! Classes are scheduled through the end of April – Join us anytime by committing with an 8-punch class card OR try us out for a single session for only $6. For awesome deals, event announcements and more, connect with Michigan Tech Recreation on Facebook. Join us anytime and COMMIT TO BE FIT. The Michigan Tech athletic training staff is holding an Athletic Training Clinic on Saturday, April 19 from 9:30 am–3 pm. The clinic will teach kids grades 9-12 the athletic training profession. Preregistration is required byApril 17 and cost is $33. The clinic will include a tour of Tech’s Kinesiology Department and educational sessions on what an athletic trainer does as far as injury assessment, injury treatment, taping, stretching and sports medicine. There will also be a question and answer session with current Tech student-athletes and athletic training students. The clinic includes lunch, an athletic training kit and prizes. Register online or by calling 906-487-2073. Full payment and a signed waiver release is required. For more information call 906-487-1847 or email mogino@mtu.edu.